Hi everyone. My son and I have the day off so we got to do some stamping and coloring together. Love hanging out with him! 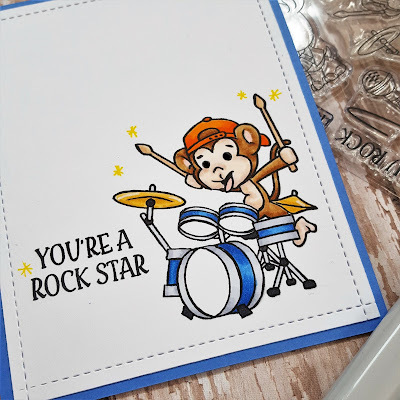 For my project, I made a cute birthday card with a rockin' monkey. I am participating in Kathy Racoosin's 30 Day Coloring challenge and this was my first day of coloring. 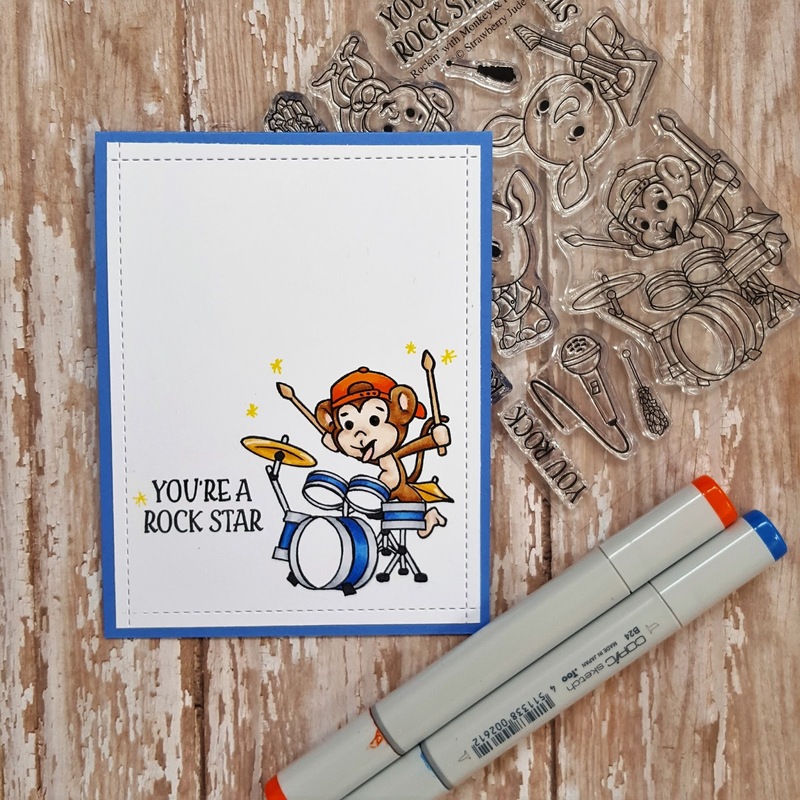 I am sure that I won't always get a card out of it but I am glad that I did today :) I started by stamping out this little monkey on white cardstock and colored him in with copics. When I was done, I restamped (with my misti) because several of the lines faded. I added black enamel dots on the eyes and drew little yellow stars around his drumsticks. For the dashed edging, I used a straight border die on all four sides and then added the sentiment. 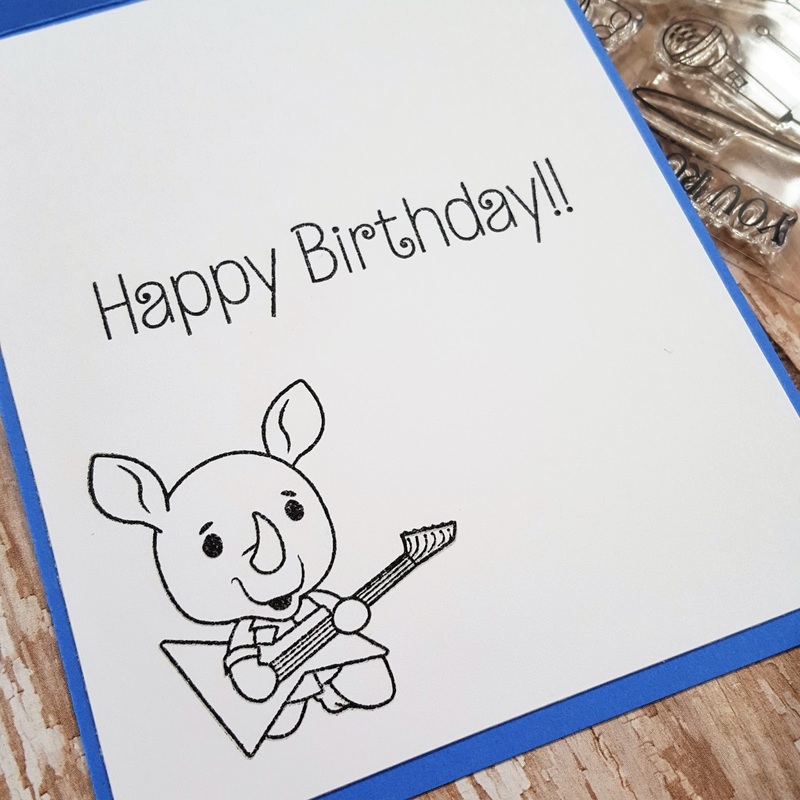 I attached the colored panel to a top folding A2 blue card base and added another white panel inside with "happy birthday" and a guitar playing rhino. These little critters are so cute! 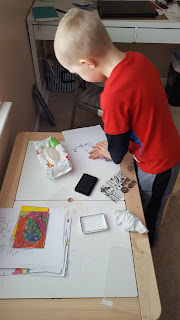 And here is a picture of my son working on his project. He loves to stamp although he is like me and isn't as fond of cleaning them off after. He was making a space scene with planets and astronauts and told me he wants to be an artist and lego builder when he grows up, lol. Wow such a great and funny image love it. Thanks for sharing this with ATCAS. What a fun way to spend quality time with your son!! Very cute cards indeed. 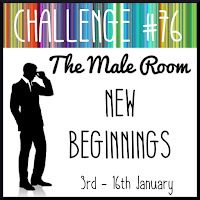 Thanks for linking up to our New To Me challenge gallery at a2z. So glad you got to hang out with your son. And the card is darling. 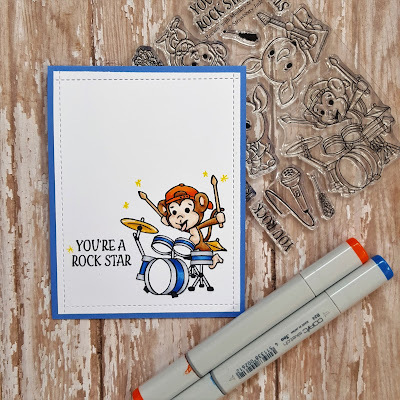 So glad you joined us at A2Z Scrapbooking. And another generation of stampers is born. How great that your son loves to stamp with you, Cheryl. Your rocking monkey is so cute and I love that you added his band member to the inside of the card. 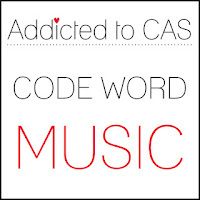 I'm so glad you shared this with us at Addicted to CAS. Eine wunderschöne Karte. Vielen Dank für deine Teilnahme bei den Animal Friends. What a super cute card. Your colouring/shading is so well done. Thanks for joining us at a2z Scrapbooking. so cute! 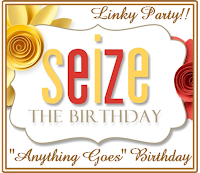 thanks for joining in at a2z!